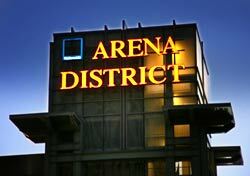 The Arena District is the premier entertainment district in downtown Columbus and one of the hottest urban residential areas in the state. 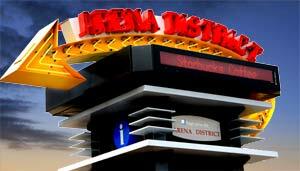 The Arena District offers an experience unlike any other. With its exceptional dining, accessible parking, live entertainment and affordable hotels, families, couples and singles alike, can enjoy the district and all that it has to offer. At the heart of the district is the Nationwide Arena, home to the National Hockey League's Columbus Blue Jackets, the United States Hockey League's Ohio Junior Blue Jackets and a wide variety of world-class entertainment events. Located on the corner of Nationwide Boulevard and Front Street in downtown Columbus, the $150 million facility opened its doors in September 2000, raising the bar of excellence for sports and entertainment facilities across the country. 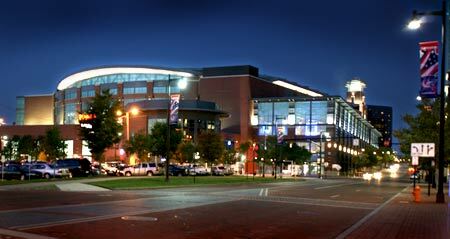 Around the Arena are restaurants, bars, theaters, the Columbus Convention Center , and the Union Station Arch. (Read more about the former Union Station Train Depot.) In 2009 Huntington Park opened its gates for the Columbus Clippers. The Clippers is a AAA ball club that was formed in 1977 and played in Cooper Stadium until the new ball park was completed. 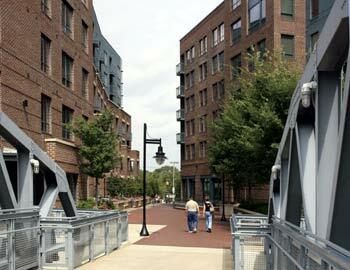 The Arena District is now also one of the hottest urban living areas. The Buggy Works, Burnham Square Condos, the North Bank Park Condos, and Arena Crossing Apartments are some of the prime properties available in the Arena District. New condo units are currently being developed including the new Firestone Alley which will be just west of the Nationwide Arena. These high-end condos are priced from $160s to well over $800,000 and the best part is everything is within easy walking distance. This new urban neighborhood is not only close to the arena and surrounding quality night-life features, but also nearby is the North Market, the riverfront, brick paved boulevards with tree-lined streets and open green spaces. The Arena District Athletic Club ties a unique urban setting and the prestige of a luxury club all into one package. Located directly across from the Arena, the Club offers premium equipment and services in one fitness center. Nominated for Best New Major Concert Venue by Pollstar Magazine in 2001, the Lifestyle Communities Pavilion is the place to see big shows in an intimate setting. It’s the place where you can find balcony box seats, listen to your favorite bands and have after show meet and greets. The contemporary Lifestyle Communities Pavilion is an entertainment facility unlike any other in the nation. Showcasing the first ever Vertere stage, a reversion stage, which serves both 2,200 patrons indoors or 4,500 patrons in the backyard (outdoors) amphitheater, allows the show to go on no matter what the weather might be-- and in Columbus, that might just be anything. Crowne Plaza offers excellent service and amenities for 384 guestrooms with meeting facilities for 50 - 500 guests. (614) 461-4100 / 33 Nationwide Blvd. Hyatt Regency connects directly with the Columbus Convention Center, offers accomodations for 631 guest rooms. (614) 463-1234 / 350 N. High St. The Lofts offers New York loft-style accomodations, featuring 44 large rooms with high celings, and exposed brick, wood beams and floor to celing windows. 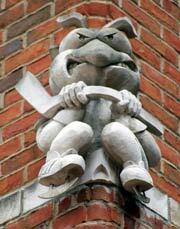 Located in the historic Carr building built in 1882. (614) 461-2663 / 55 Nationwide Blvd. We'll be the first to admit that Walk Score is just an approximation of walkability. There are a number of factors that contribute to walkability that are not part of this algorithm and make no implication of the safety of the area. The Columbus Blue Jackets are a professional ice hockey team based in Columbus, Ohio, United States. They are members of the Central Division of the Western Conference of the National Hockey League (NHL). The name "Blue Jackets" was chosen to celebrate "patriotism, pride and the rich Civil War history in the state of Ohio and city of Columbus.